My "discovery" of Pablo Diego José Francisco de Paula Juan Nepomuceno María de los Remedios Cipriano de la Santísima Trinidad Ruiz y Picasso, 25 October 1881 – 8 April 1973. The Art Gallery of Ontario has a fabulous exhibition of Picasso's works which opened in May and runs until August 26th. Today Sarah and I finally went to see it, choosing an early morning timed entry on the advice of a very smart man on the phone when we called about tickets earlier in the week. Because we are members at the AGO the exhibition was free for us; we've waited this long so we could go on a weekday while Sarah was on holidays, so it would be less crowded. The pieces are out on tour right now (Toronto is the only Canadian "stop") because the Musée National Picasso, Paris is closed temporarily for renovations and we were very lucky to get to see some of these works. I had never been that much of a fan of Picasso's work (and Sarah is definitely not) but this was a tremendous opportunity to view the progression of his style and learn more about his life and how it affected his work. Well, I must say the exhibition was a revelation for me. Some of Picasso's early work was absolutely beautiful and it wasn't long into the show before I realized his progression into what became known as Cubism was really a case of Picasso painting like a sculptor. (I feel that Sarah, too, paints and sketches like a sculptor; consequently I can see a lot of similarities between Picasso's early line drawnings and some of Sarah's work.) As I watched this particular one of his many and varied styles develop I finally understood what he was doing with the sharp lines and odd vantage points and it started to "click" in my head. I think my favourite piece of the whole show was this Man with Guitar, which was paired with Man with Mandolin, both from 1911. These two pieces are the only survivors of the beginnings of an eleven-panel set which was commissioned by a Brooklyn collector for his library. Before Picasso could finish, however, the collector changed his mind and withdrew the commission. Picasso reused the other canvases in one way or another and these are the only two elements of the set that remain. This one, in particular, really appealed to me; this two-dimensional image of the work does not do it justice (when does it ever?) and standing right in front of this painting you really get the sense of the 3-D aspect of the work. In particular, around the sound hole of the guitar Picasso has layered his work in such a way that the instrument fairly pops out at the observer. It really captivated me - so much so that Sarah and I traveled back to see it once we had finished walking the show, just so it would be the last image I took away with me. I could have stood in front of this piece for a much longer time, but the gallery had started to fill up by the time we were done. We really enjoyed the audio tour, in particular the observations of Chiyo Ishikawa of the Seattle Art Museum and the incomparable Chuck Close. A close second for me as favourite piece of the show was his 1944 sculpture, Man with a Sheep. I took the time to walk all the way around this work and some of the detail was absolutely gorgeous. I was particularly struck by how perfectly Picasso had captured the legs of the sheep; even the bend in the knee of the one leg that is not being held by the man is spot-on. I loved the curve of the sheep's ears and the cloven hooves. I also noticed that the sheep's eye that faced frontwards, away from the man, was a "Picasso eye" with the round, flat, opaqueness that characterized many of the eyes of his previous work; however, the rear-facing eye (the right eye) was "normal" and really quite beautifully done. I think this is part of the frustration of Picasso for some people: he was supremely talented as a "pure" artist but instead chose to spend much of his life experimenting with styles and form that were about as unconventional as you could possibly get. This fascinates me about him, but I can certainly understand the other point of view. It also amazes me to no end how prolific he still was right up until he died in his ninety-second year; by way of contrast, I met A.Y. Jackson not long before he died, which came a year after Picasso at almost exactly the same age. He was a delightful man but very feeble and wheelchair-bound. That Jackson meeting was wonderful, though: I was visiting the McMichael Conservation Collection in Kleinburg, Ontario at a young age (not for the first time, either) and my parents had purchased for me a book of paintings of the Group of Seven in their collection. 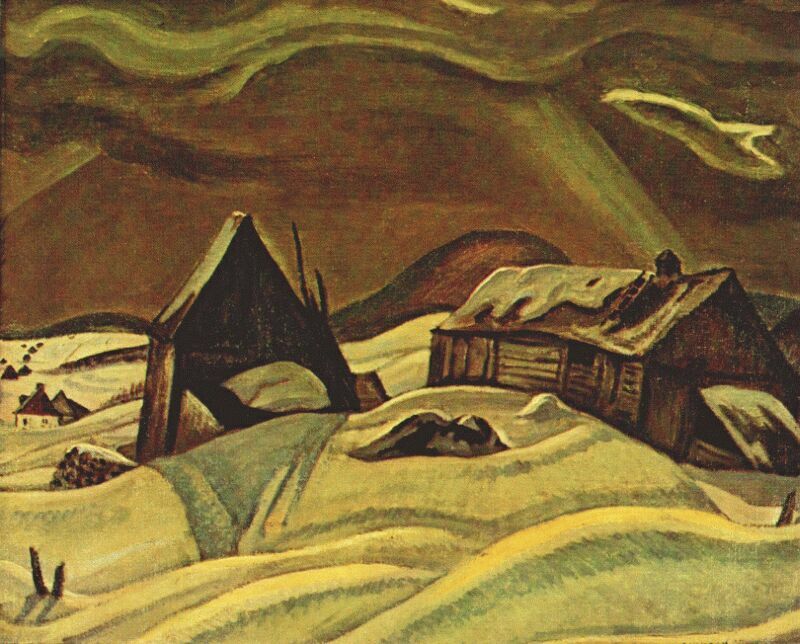 Mr. Jackson, who was living there in his final years, was wheeled into a part of the gallery that was particularly sun-filled (that sticks with me) and I approached the great artist to ask him to autograph my favourite painting of his, Grey Day, Laurentians. 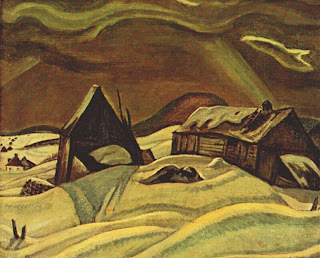 He sweetly obliged me and then asked if I'd mind if he also autographed, his favourite piece, First Snow, Algoma. He flipped the pages of my book very slowly and carefully until he found that piece and signed below it as well. I was about seven or eight years old at the time and I was star-struck. The reproduction here is not even close to the original in texture or colour; I have included it merely as a reference point so that, if you are familiar with A.Y. Jackson's work, you will know which piece I am talking about. I am looking at the book as I type this and I remember the day like it was yesterday...although it was nearly 45 years ago. Before we left the AGO we took a quick look at the Iain Baxter& [sic] exhibition in the Contemporary Art section. Sarah is fond of his work and this is one of her favourite pieces, although you'd never know it from the expression on her face. I wish I had taken a second picture! The most relaxed cat I have ever "owned"
And so we struck one more thing off of "Sarah's Staycation (erp) To-Do List". Up tomorrow: barbecue with friends we didn't get to camp with this year. This was a very well put together show, and definitely worth the visit. I find Picasso a problematic artist: he was abusive towards women, he was talented, yet worked in a "naive" style, he was a pioneer, but was also a chameleon. His work's aesthetic is in-your-face ugly, his palettes muddy and unpleasant. But of course, he would say that his works weren't about aesthetics. Historically fascinating, but definitely not high in my list of "art greats". I know of your views so I am doubly glad you came with me. :) Didn't you tell me you thought he was a bit of an innovator with his cataloguing system, too?